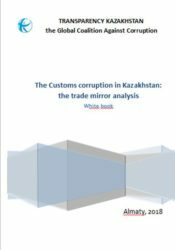 Public Foundation Transparency Kazakhstan has published the results of the study «The Customs corruption in Kazakhstan: the trade mirror analysis of trade». 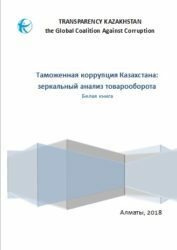 A mirror comparison of the statistical data of Kazakhstan’s trade turnover with 10 countries outside the EAEU for the period 2013-2017 showed differences in the statistics of Kazakhstan’s foreign trade with the countries of Asia, the United States and Europe. The greatest underestimation of Kazakhstan’s imports is noted for ferrous metal products, pharmaceutical, chemical products, plastic products of clothing and footwear, furniture, vehicles, rubber. China customs services of Kazakhstan underestimate the statistical data by more than 50% for 11 groups of goods. Comparison of data on trade with China shows that the real indicators of Chinese imports to Kazakhstan are underestimated to 90% for socially important groups of goods. Up to 60 to 90% of the goods imported from China of the groups «clothes», «shoes», «hosiery», «bed linen», «furniture», «toys», «fruits and vegetables», «vehicles» are actually contraband. Only 10% -45% of goods imported to Kazakhstan are subject to the relevant customs duties. This state of Affairs in the customs administration of Kazakhstan contributes to the formation of shadow business, corruption and is a direct threat to the health and safety of the nation. The Italian customs service underestimates statistical data on trade with Kazakhstan for 11 groups of goods by more than 50%. Pharmaceuticals, clothing and alcoholic beverages of Italian production constitute the main group of goods for which there is a discrepancy in the statistical data of the two countries by more than 70%. Moreover, Kazakhstan’s inflated data indicate import of counterfeit counterfeit products under Italian brands. And this is also a problem, because in the framework of the WTO, Kazakhstan must protect the copyright of the partner countries. Switzerland’s imports are undervalued by the customs authorities of both countries. Thus, the Kazakh customs understatement is recorded for 4 groups of goods, Swiss for 6 groups of goods, which also indicates the penetration of the share of counterfeit products under Swiss brands in Kazakhstan. A mirror analysis of the statistical data showed that the products, which have become the «visiting card» of Switzerland, are included in the group of goods for which Kazakhstan understates payments by the customs authorities of Kazakhstan to 100%. These are knitted clothes and accessories, tobacco, chemical products, precious metals and jewelery, cultured pearls, plastic and ferrous metal products, watches. It should also be noted, for the most part these are items from the expensive segment especially jewels and watches. USA customs Services in their reports provide reporting data, which is less by 50% for 11 groups of goods exported to Kazakhstan. The customs of Kazakhstan for 5 years underestimates the data on imports of one group of goods from the United States by more than 50%. There are American chemical products, medicines, vehicles, ferrous metal and rubber products, mineral fuels, which again raises the question of the import of products from third countries. Customs authorities in Germany say that they are imported to Kazakhstan for less than half of the ferrous metal than they are fixed by the Kazakhstan customs service. 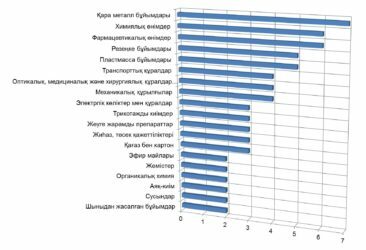 The overestimation of the statistics by the Kazakh side indicates the penetration of fake products under German brands into the country. Imports of Polish goods are understated by the customs authorities of both countries. 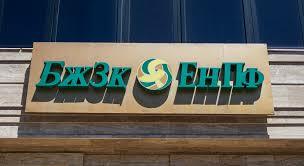 Thus, the Kazakh customs on 6 groups of goods recorded 50% less production. In turn, Poland notes that imports to Kazakhstan by 50% less than one group of goods. 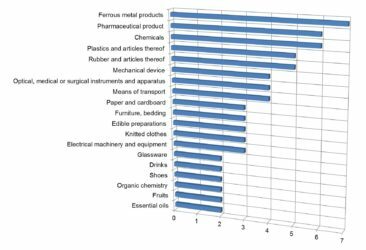 The main products for which the data comparison showed a data gap of over 60% are ferrous metal products, industrial machinery, and Polish furniture. Pakistan customs declares 80-100% less goods exported to Kazakhstan than the receiving party. There are applies to fruits, vegetables, citrus fruits, as well as clothing and jewelry of Pakistani origin. Customs in the UK for eight groups of commodities represent the data in two times less than the fixed Kazakhstan customs services, which reflects the high proportion of imitations of the English brands. Comparison of turnover showed the difference at the level of over 80% on English alcohol, automobile, rubber products, art objects and second-hand clothes. For three groups of goods from South Korea, Kazakhstan understates its reporting data by more than 60%. At the same time, the South Korean customs authorities for 5 groups of goods recorded a smaller volume of exports than the host country of Kazakhstan. These are aluminum products, perfumes and cosmetics, organic and inorganic chemistry, confectionery products. Japan in its reports underestimates the volume of exported goods in 10 groups. A detailed comparison of trade data with Japan showed a difference of over 60% for such groups of goods as electric machines, optical and photographic machines, machinery, ferrous metal and glass products, chemical products, paper and cardboard, as well as edible products. At the same time, the overstatement of statistics by the Kazakh side indicates the import of counterfeit products under Japanese brands. Below are 6 countries-for three of them customs data on imports are understated, for the other three are overstated. In the first case, the problem is probably smuggling, in the second case, counterfeiting is possible. But in any case, the difference goes to billions of US dollars, which is a significant problem for the country’s budget. The study took into account that the source of discrepancies may be different dates of accounting for exports and imports, the moment of transfer of goods across the state borders of counterpart countries, as well as various methodologies of imported / exported goods. At the same time, according to expert estimates, discrepancies in statistical data due to the difference in the applied methodologies can reach 40-45%. A difference of over 50% indicates the presence of signs of corruption in the customs authorities. 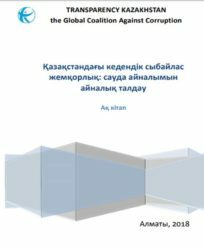 Thus, the state authorities of Kazakhstan are recommended to take measures to eliminate corruption schemes in the activities of the customs authorities of Kazakhstan. It is necessary to raise the question in the whole of the EAEU on how to verify the data and monitor the counterfeit, as the distribution of customs duties comes from the general Fund. For more information on the White Book can be found at the link. Общественный фонд Transparency Kazakhstan представляет результаты исследования «Таможенная коррупция Казахстана зеркальный анализ товарооборота«, проведенного благодаря гранту Transparency International. В настоящем исследовании проанализирован товарооборот между Казахстаном и десятью странами партнерами, не являющимися участниками ЕАЭС. По данным, представленным Казахстаном в ВТО, за последние пять лет наблюдается снижение объёмов импортной продукции, завозимой в Казахстан. Однако по сведениям стран-партнеров, доля экспортируемых товаров в Казахстан ежегодно увеличивается. Примечательно, что разница в официальной статистике между Казахстаном и следующими странами-партнерами по объему товарооборота доходит до 100%. Это: Китай, Италия, США, Германия, Швейцария, Польша, Пакистан, Великобритания, Южная Корея и Япония. Вместе с тем, по экспертным оценкам, расхождения в статистических данных из-за разницы в применяемых методологиях могут доходить до 40-45%. Разница свыше 50% свидетельствует о наличии в таможенных органах признаков коррупции. с 10 странами, не входящими в ЕАЭС за период 2013-2017 годов показало следующее. Таможенные органы Германии отмечают, что ввозят в Казахстан на половину меньше изделий из черного металла, нежели их фиксируют казахстанские таможенные службы. Пакистанская таможня декларирует на 80-100% меньше товаров, вывозимых в Казахстан, нежели принимающая сторона. По трем группам товаров из Южной Кореи Казахстан занижает свои отчетные данные более чем на 50%. При этом южнокорейскими таможенными органами по 5 группам товаров фиксируется меньший объем экспорта, нежели у принимающей стороны – Казахстана. Наибольшее количество не стыковок в статданных стран наблюдается по таким группам товаров, как изделия из черных металлов, фармацевтические продукты, химические продукты, изделия из пластмассы. Ниже выделены 6 стран – по трем из них таможенные данные по импорту занижаются, по другим трем завышаются. В первом случае проблемой является, возможно, контрабанда, во втором случае возможно контрафакт. Разница идет на миллиарды долларов США, что является существенной проблемой для бюджета страны. Сопоставление таможенной статистики показало расхождения в статданных внешней торговли Казахстана как со странами Азии, США, так и Европы. Расхождение данных более 50% свидетельствует о наличии в таможенных органах Казахстана следующих признаков коррупции как вымогательство и дача взяток с целью избежать налогов и тарифов через занижение экспорта и чрезмерное выставление счетов на импортную продукцию, а также поставки контрафактных товаров. Более подробно с Белой книгой можно ознакомиться по ссылке.